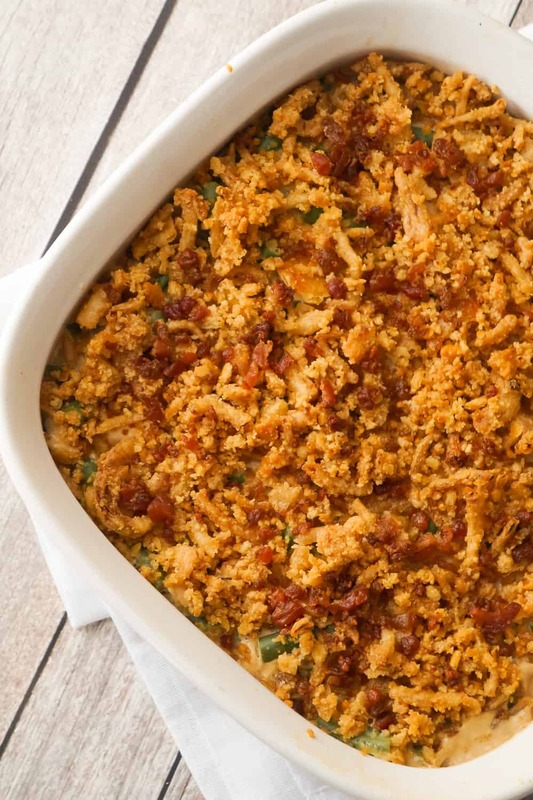 Cream Cheese and Bacon Green Bean Casserole is an easy side dish recipe perfect for Thanksgiving or Christmas. This easy green bean casserole recipe can serve 8-10 people and takes just over half an hour from start to finish. 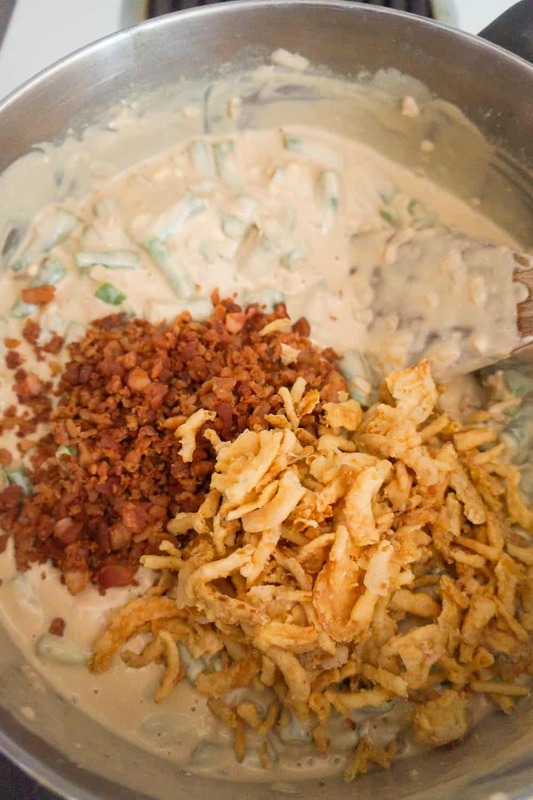 This creamy green bean casserole is loaded with real bacon bits and topped with Ritz Crackers and French’s Fried Onions. 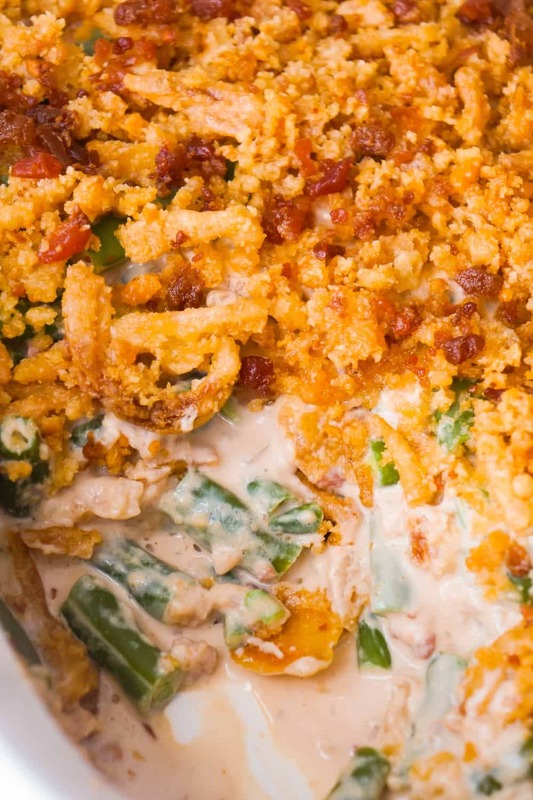 Watch the video to learn how to make Cream Cheese & Bacon Green Bean Casserole! 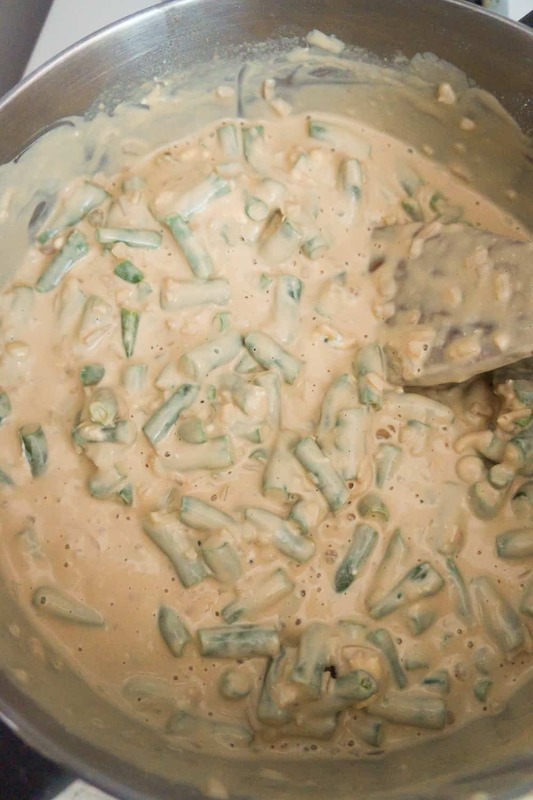 To make this cream cheese green bean casserole, I started by pouring some milk into a large saucepan on the stove. 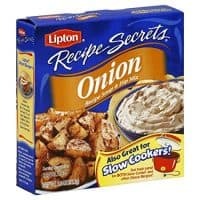 I added two pouches of Lipton Onion Soup & Dip Mix to the milk and stirred it well. Then I brought the liquid to a boil. 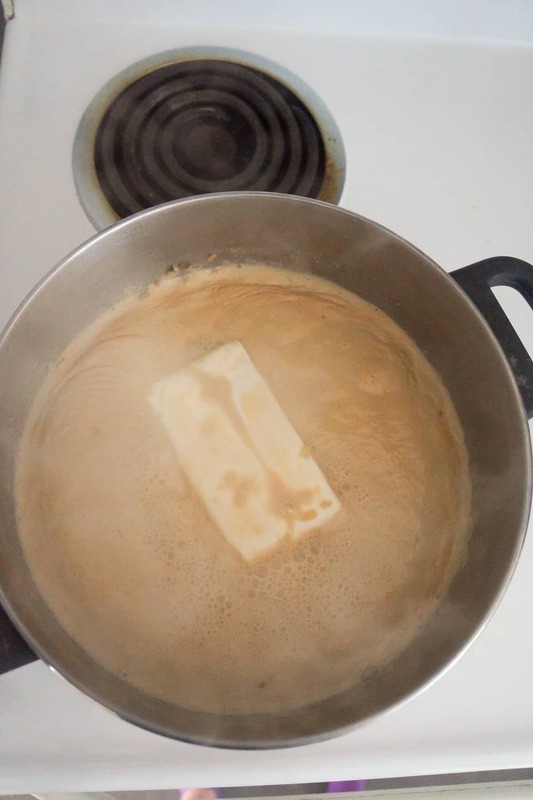 Once it was boiling I reduced the heat to medium and added a brick of cream cheese to the pot. I stirred until the cream cheese was completely melted. Then I added some frozen green beans to the pot. I stirred the beans until they were completely coated in the onion soup and cream cheese mixture. 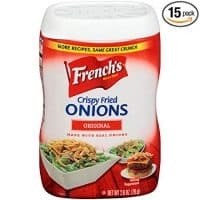 Then I added some real bacon bits and French’s fried onions to beans. I stirred all of the ingredients together really well and then reduced the heat to low while I went to prepare the topping mixture. 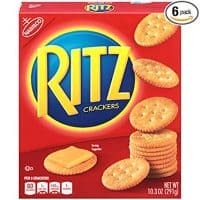 To make the topping I started by placing some Ritz Crackers in a Ziploc bag and crushing them with a rolling pin. 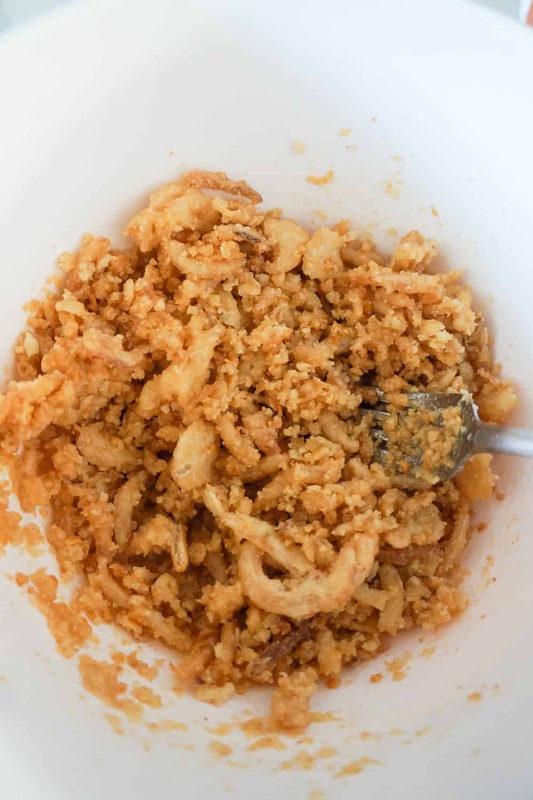 I poured the crushed Ritz Crackers into a small mixing bowl along with some French’s fried onions and some melted butter. I used a fork to mix all of the ingredients together really well. Then I dumped the green bean mixture into a greased 9 inch square baking dish. I sprinkled the topping mixture over the green beans spreading it out as evenly as possible. 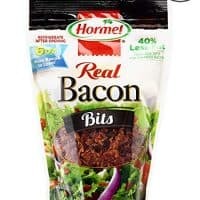 Then I sprinkled some real bacon bits on top. I baked the casserole until the topping was just starting to brown. 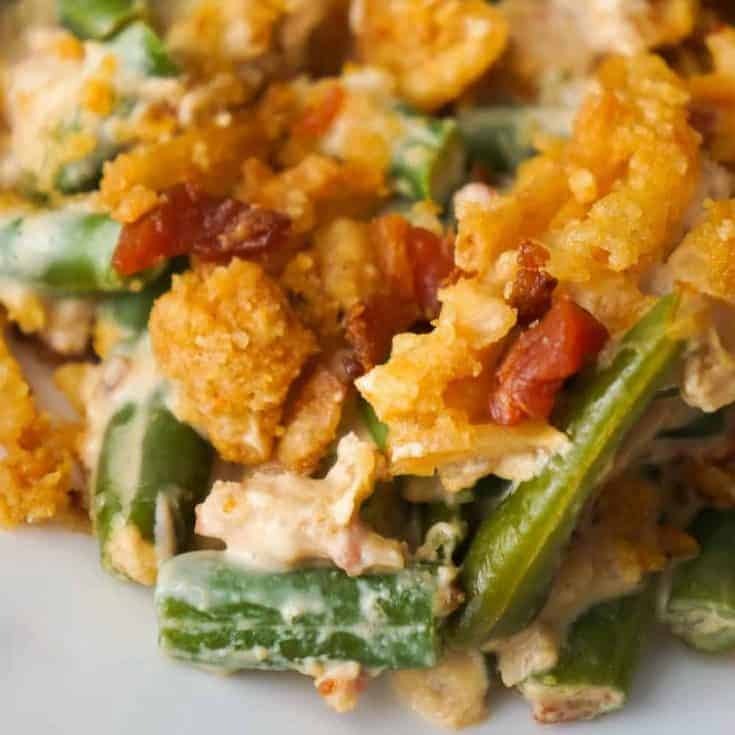 This creamy green bean casserole is packed with flavour and the crunchy topping adds some great texture to the dish. This simple recipe, using frozen green beans and onion dip mix instead of canned soup, is the perfect side dish for almost any dinner. 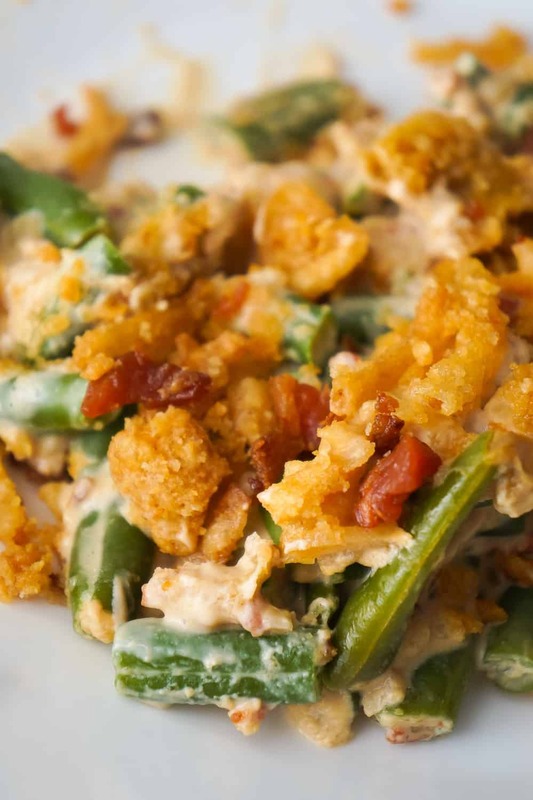 Serve this Cream Cheese & Bacon Green Bean Casserole with French’s Fried Onions and Ritz Crackers at your next holiday meal. 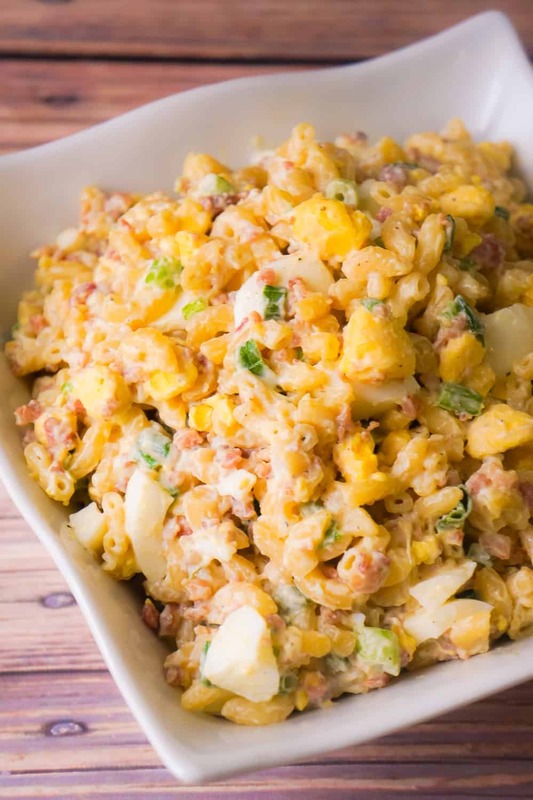 Another delicious side dish perfect for Thanksgiving. 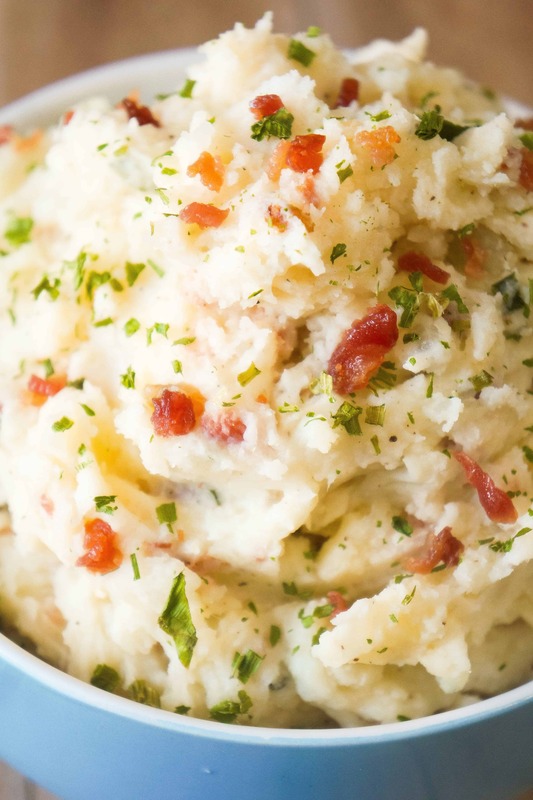 Check out these Bacon Cream Cheese Mashed Potatoes! Another delicious side dish recipe. 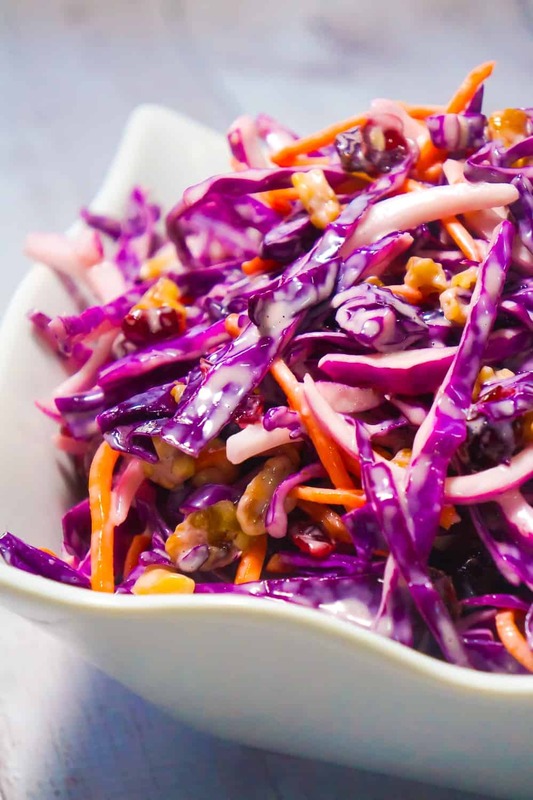 Check out this Cranberry Walnut Coleslaw! 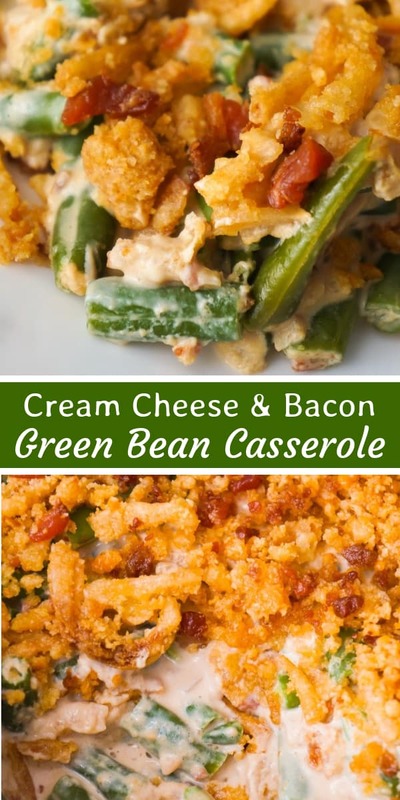 Cream Cheese and Bacon Green Bean Casserole is an easy side dish recipe perfect for Thanksgiving or Christmas. 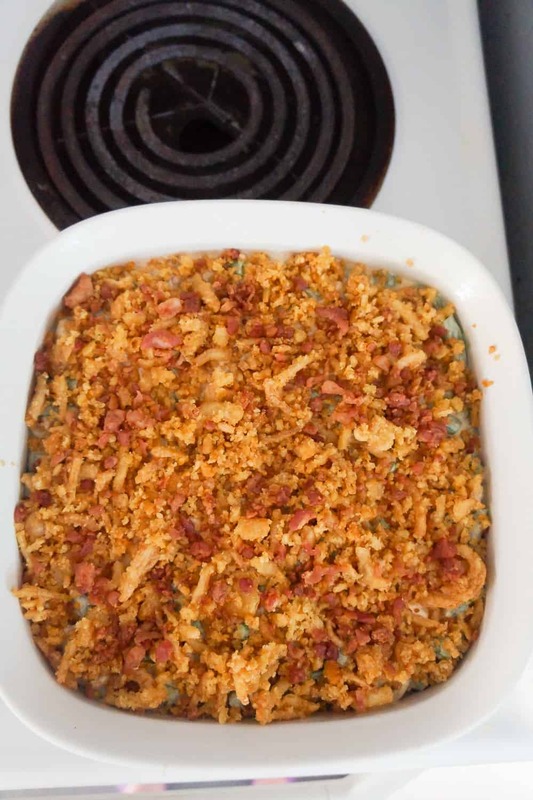 This creamy green bean casserole is loaded with real bacon bits and topped with Ritz Crackers and French's Fried Onions. 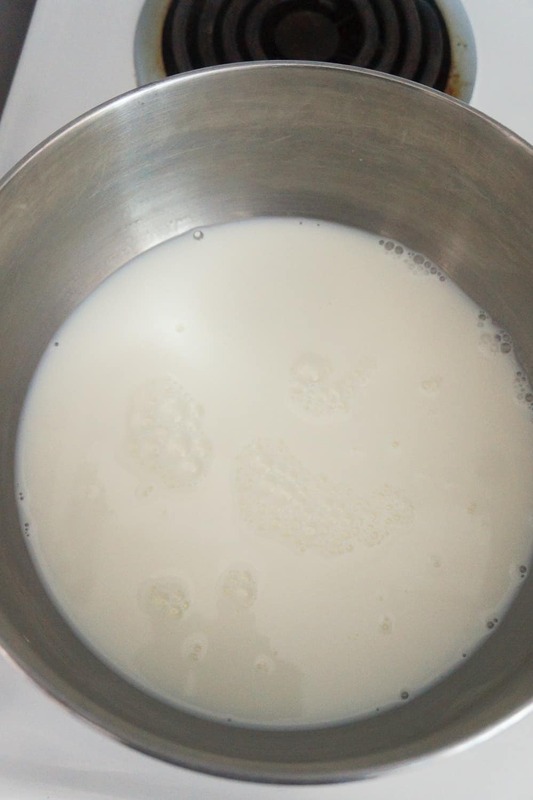 Pour milk into large saucepan. 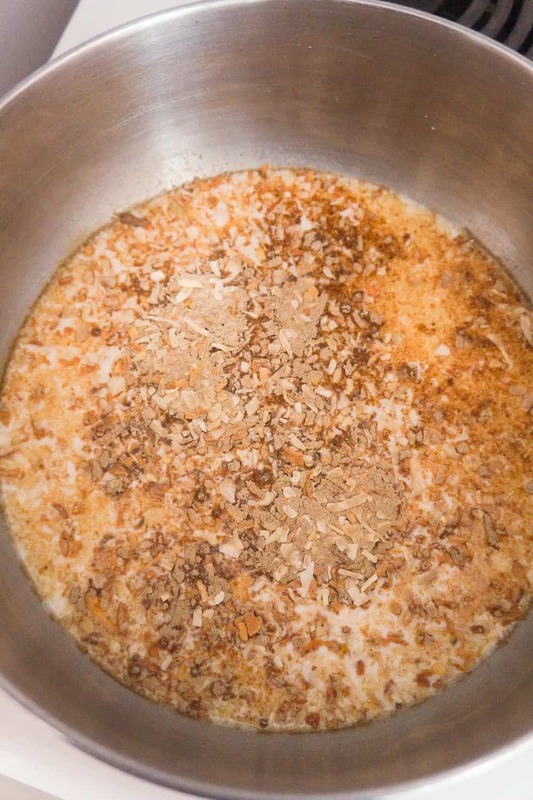 Add the onion soup mix to the milk and stir well. Bring to a boil. Add the cream cheese to the pot and reduce the heat to medium. Stir until the cream cheese is completely melted. 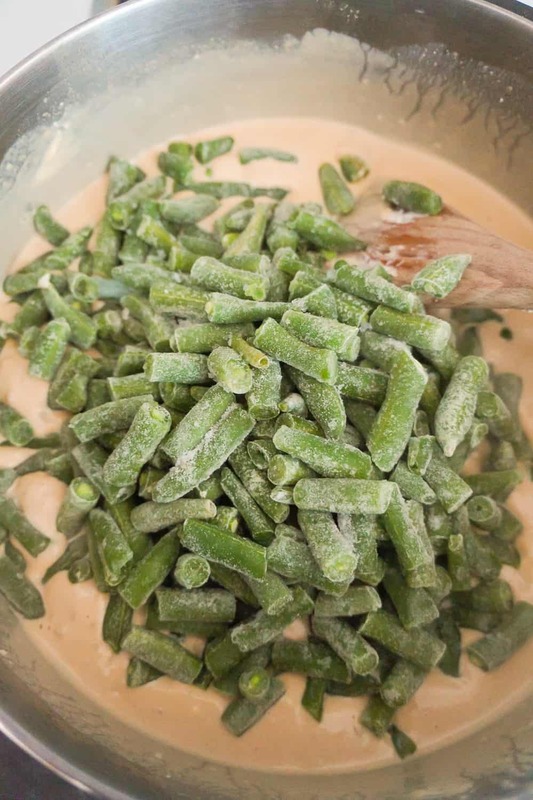 Add the frozen green beans to the pot and stir until they are completely coated in the soup and cream cheese mixture. Add 1/2 cup bacon bits and 1 cup fried onions to the pot and stir well. Reduce heat to low. 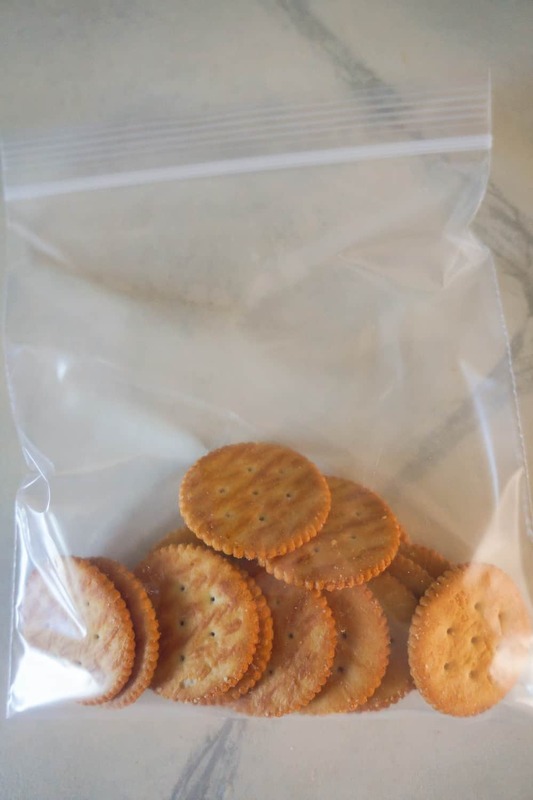 Place the Ritz crackers in a Ziploc bag and crush with a rolling pin. 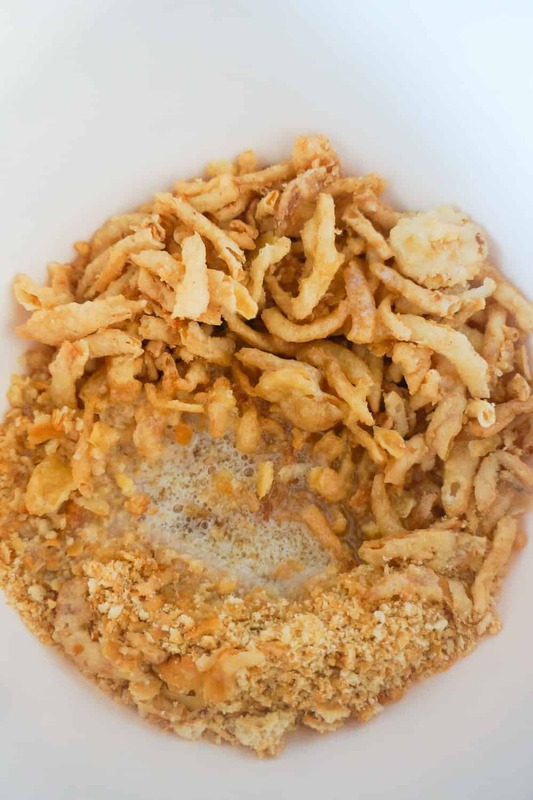 Pour the crushed Ritz crackers into a small mixing bowl along with 1 cup fried onions and the melted butter. Use a fork to combine all of the ingredients. 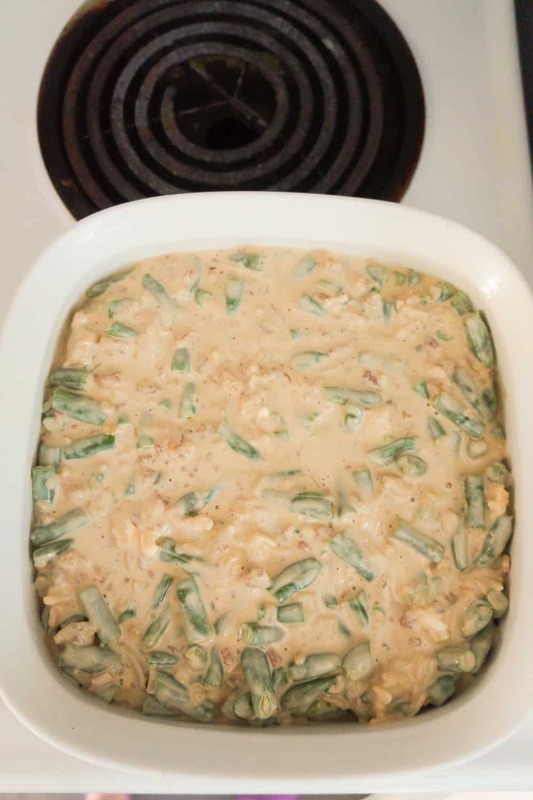 Dump the green bean mixture into a greased 9 inch square baking dish and spread it out evenly. Sprinkle the topping mixture over the green beans. Place the casserole in the oven and bake until topping is just starting to brown. 14-16 minutes. Allow the casserole to sit for a few minutes before serving.